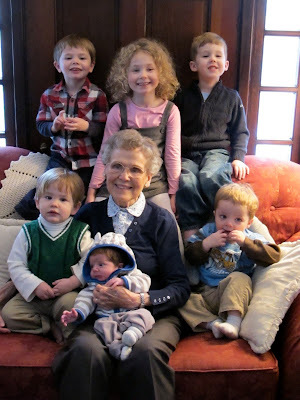 Life in the Valley: "Picksburgh in Pitchers"
with six of her seven great grandchildren. There would have been more, but I managed to delete all of my Pittsburgh pictures while trying to delete older pictures from my full memory card. Colin saved the day by telling me they could be recovered, if I didn't use the card until I got home. As you can see, he recovered them! We had a great time with the other grandparents too, but I couldn't photo document our trips to swim, sled, Chuck E Cheese, and Chick Fil A! i forget how pretty the snow is!! and the pics with great gram is great...how did you get so many kids to look at the camera? ?